Ahu Tongariki (Arian Zwegers/Flickr, CC BY 2.0). Outer slope of the Rano Raraku volcano (Nightscream/Wikipedia, CC BY-SA 3.0). Rapa Nui National Park is a protected Chilean wildlife area located in Easter Island, which concentrates the legacy of the Rapa Nui culture. This culture displayed extraordinary characteristics that are expressed in singular architecture and sculpture within the Polynesian context. Easter Island, the most remote inhabited island on the planet, is 3,700 kilometres from the coast of continental Chile and has an area of 16,628 hectares while the World Heritage property occupies an area of approximately seven thousand hectares, including four nearby islets. The island was colonized toward the end of the first millennium of the Christian era by a small group of settlers from Eastern Polynesia, whose culture manifested itself between the eleventh and seventeenth centuries in great works such as the ahu –ceremonial platforms- and carved moai – colossal statues- representing ancestors. Rapa Nui National Park most prominent attributes are the archaeological sites. It is estimated that there are about 900 statues, more than 300 ceremonial platforms and thousands of structures related to agriculture, funeral rites, housing and production, and other types of activities. Prominent among the archaeological pieces are the moai that range in height from 2 m to 20 m and are for the most part carved from the yellow–brown lava tuff, using simple picks (toki) made from hard basalt and then lowered down the slopes into previously dug holes. There are many kinds of them and of different sizes: those in the process of being carved, those in the process of being moved to their final destinations –the ahu-, those being torn down and erected. The quarries (Rano Raraku and others) are invaluable evidence of the process of their carving. The ahu vary considerably in size and form; the most colossal is the Ahu Tongariki, with its 15 moai. There are certain constant features, notably a raised rectangular platform of large worked stones filled with rubble, a ramp often paved with rounded beach pebbles, and levelled area in front of the platform. Also extremely valuable are the rock art sites (pictographs and petroglyphs), which include a large variety of styles, techniques and motifs. Other archaeological sites are the caves, which also contain rock art. There is also a village of ceremonial nature named Orongo which stands out because of its location and architecture. While it has not attracted as much attention, the housing and productive structures are of extreme interest. 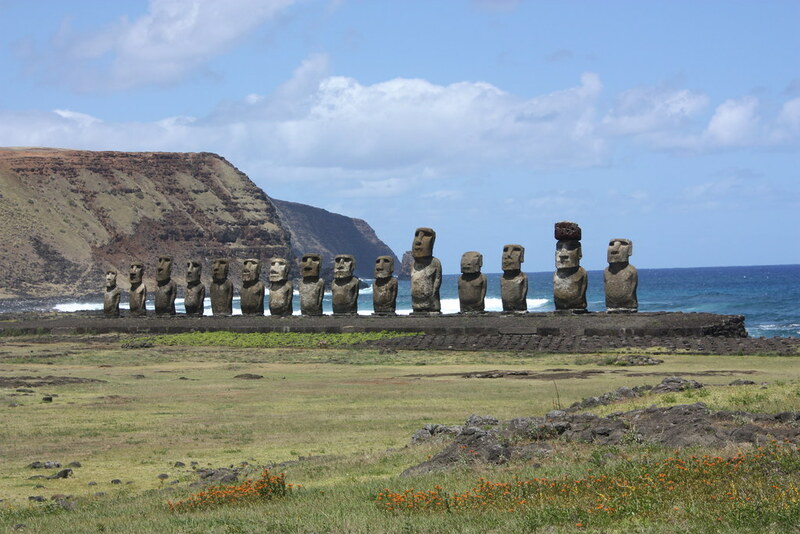 According to some studies, the depletion of natural resources had brought about an ecological crisis and the decline of the ancient Rapa Nui society by the 16th century, which led to decline and to the spiritual transformation in which these megalithic monuments were destroyed. The original cult of the ancestor was replaced by the cult of the man-bird, which has as exceptional testimony the ceremonial village of Orongo, located at the Rano Kau volcano. Fifty-four semi-subterranean stone-houses of elliptical floor plans complement this sacred place, profusely decorated with petroglyphs alluding to both the man-bird and fertility. This cult would see its end in the middle of the nineteenth century. Colonization, the introduction of livestock, the confinement of the original inhabitants to smaller areas, the dramatic effect of foreign diseases and, above all, slavery, reduced the population of Rapa Nui to little more than a hundred. Currently, the island is inhabited by descendants of the ancient Rapa Nui as well as immigrants from diverse backgrounds, accounting for a significant mixed population. Critère (i): Rapa Nui National Park contains one of the most remarkable cultural phenomena in the world. An artistic and architectural tradition of great power and imagination was developed by a society that was completely isolated from external cultural influences of any kind for over a millennium. Criterion (iii): Rapa Nui, the indigenous name of Easter Island, bears witness to a unique cultural phenomenon. A society of Polynesian origin that settled there c. A.D. 300 established a powerful, imaginative and original tradition of monumental sculpture and architecture, free from any external influence. From the 10th to the 16th century this society built shrines and erected enormous stone figures known as moai, which created an unrivalled landscape that continues to fascinate people throughout the world. Criterion (v): Rapa Nui National Park is a testimony to the undeniably unique character of a culture that suffered a debacle as a result of an ecological crisis followed by the irruption from the outside world. The substantial remains of this culture blend with their natural surroundings to create an unparalleled cultural landscape. Most of the island, with three volcanoes, lakes and villages, is national parkland and a UNESCO World Heritage Site. It has nearly 1,000 moai – monolithic, enigmatic (it is a mystery how they were moved to their places by a Stone Age culture) and monumental statues (some weigh up to 82 tons) carved from tuff or tufa (volcanic rock) depicting humans, and sometimes called “heads” or “big heads.” I took a tour to see the statues that locals sometimes tell visitors act as “antennas.” Placed over graves of distinguished ancestors believed to possess “manna,” a supernatural quality that protects people, the statues “beamed” the “manna” from the ancestors back to the living through their eyes. We toured the ceremonial site of Tahai in the town of Hanga Roa, where statues are displayed on altar-like platforms called ahu. We also visited Ahu Tongariki, the largest ceremonial center of the island with the Pacific Ocean on its back and 15 “moai” (one of them 30 feet tall) and we toured Rano Raraku, the volcano that was turned into the main quarry for the “moai.” The quarry has about 400 “moai” scattered around including the famous “Big Heads.” Of the 400 statues here about half are finished and the rest were never completed. Among the unfinished statues is a 71-foot-high one estimated to weigh 200 tons. Amazing!